Communication that frightens employees triggers more behavior changes than similar messages without the scare factor. Including a fear appeal makes it much less likely that process safety incidents will be repeated. When an incident occurs at a chemical process industries (CPI) facility, the first reaction is usually shock and fear. Process safety managers take steps to ensure that the same mistakes are not repeated, perhaps by reviewing their facility’s process hazard analysis (PHA) documentation. Incident investigation teams are mobilized to determine what went wrong and how it could have been prevented. Employees who were involved in the incident vow to never forget the missteps that were made and the awful consequences that ensued. However, there is often no established way for employees who were not involved in the incident to learn from those mistakes. A process safety manager may send an email instructing operators and staff on the correct way to perform a task, but the communication may be brief or unmemorable. After a major incident, such as a fire, explosion, injury, or fatality, your communication to your employees should scare them. Communicating major incidents in a way that frightens employees is the best way to ensure a similar incident does not occur in the future. This article describes the best way to incorporate “fear appeals” into communications with staff. 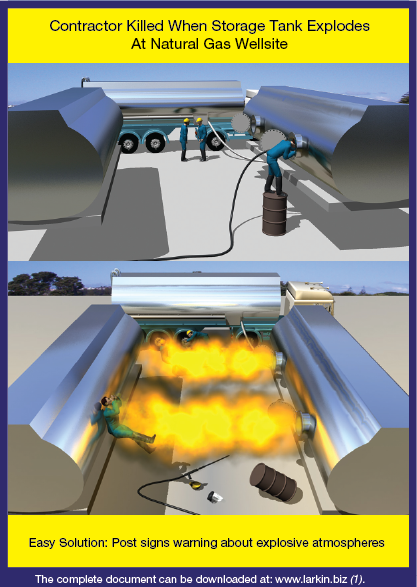 Four examples demonstrate how real-life incidents can be recreated through artist renderings to help ensure such incidents do not occur again (1). A contractor was killed after attempting to clean a storage tank that held an explosive atmosphere. Background. At an onshore oil and gas site, a contractor was tasked with cleaning a storage tank filled with sand, fracking chemicals, and water. no one warned the contractor about the potential for explosion. Consequences. During cleaning, the tank exploded and killed the contractor. A supervisor and another contractor were seriously burned when the explosion blew out through the back hatch. The ignition source was never found. Communication. This is the first page of the document created to educate others about this incident. After the fear appeal on the first page, the second page includes additional information about the incident and instructs readers on how to avoid incidents like this one. Fear appeals are a type of communication designed to frighten those who see them. Communicators use fear appeals because they work. Research shows that messages with a fear appeal produce significantly more change than similar messages without the fear appeal, often double the amount of behavior change (2). Fear appeals are best communicated face to face by supervisors to employees. the solution — a recommended action offering the viewer a way to avoid becoming a similar victim. It is essential that the disturbing photo or illustration is sufficiently unpleasant to create a physiological reaction in the viewer. This unpleasant feeling is the fuel for the behavior change. If there is no discomfort, there is no behavior change. Highly successful fear appeals scare the reader into making a positive change. Along with the disturbing illustration or photo, it is equally important to give the viewers a solution (3). The solution is a recommended action the viewer can take to avoid becoming the next victim. Fear appeals have been shown to effect more behavior changes when the message gives readers an easy-to-implement solution (4). The easier the solution is to implement, the more likely readers are to make a change in their behavior. Fear appeals are most effective when recommending simple actions, such as wearing seat belts, not texting while driving, taking a multivitamin, getting a mammogram, driving slower in a school zone, etc. For example, a scary image of tooth decay combined with a recommendation to floss will generate more behavior change (flossing) than a scary image of lung cancer with the recommendation to stop smoking. Why? Because it is much easier to floss than to stop smoking. Fear appeals that showed frightening images of AIDS patients resulted in 48% more students using condoms (a relatively easy-to-do recommendation) (5). In another study, scary images of people suffering from tetanus combined with a phone number, hours, and directions to the tetanus injection location prompted 30% of those who saw the message to get the injection (6). Only 3% of those who saw the message without the easy solution (i.e., address, map, phone number, hours of the vaccination clinic) got the injection. Combining the fear appeal with the simple solution delivered a tenfold increase in behavior change. If the fear appeal recommends complicated or difficult solutions, viewers will find it easier to dismiss the message instead of adopting the recommended solution. For example, fear appeals do not work well in combating obesity or ending a drug addiction. Changing what you eat and beginning a long-term exercise program are difficult actions, as is overcoming a drug addiction. Even without an easy-to-implement solution, fear appeals can be moderately successful, but will result in less change than a fear appeal with an easy solution. A painter died when a scissor truck elevated unexpectedly. Background. A painter and his assistant were painting a sprinkler pipe. They were working about 2.5 ft below the ceiling on a scissor truck. The scissor truck could not get directly under the sprinkler pipe, because the pipe ran very close to the wall. Therefore, both painters were leaning over the top guardrail of the scissor truck. after overriding the enable button, the platform could rise by moving the joystick alone. Incident. During painting, one painter’s safety harness became wrapped around the joystick. As the painter leaned over the platform to reach the sprinkler pipe, the joystick was inadvertently pressed forward. The rising platform squeezed his head between the top guardrail and the ceiling. The painter’s head was crushed and he died. Communication. This is the fear appeal portion of a communication that was created to warn others about tampering with safety controls. It recommends the following easy-to-do solution: Do not override safety features. Fear appeals are a perfect fit for communicating incidents in the CPI. The potential for disastrous events is always present in CPI facilities. Fortunately, many can be avoided with relatively simple actions. For example, in 70% of fatalities associated with lockout/tagout mistakes or errors, the worker did not attempt any sort of lockout procedures (7). While locking out may be a hassle or inconvenient, it is much easier to do than, for example, completely changing the way you eat, sticking to an exercise program, or kicking an addiction to cigarettes. Approximately half the people who have been fatally injured in working-at-height incidents were wearing a safety harness (8). Although they may have been wearing a harness, they did not attach the lanyard to an anchor point. While attaching the lanyard may be inconvenient, it is still a relatively easy-to-do solution. do a Take 5 risk analysis (i.e., taking five minutes to think about the job and assess hazards) before starting a job to notice any risks not covered in the permit to work. The combination of disastrous consequences and easy-to-do recommendations make fear appeals very effective for the CPI. A pneumatic plug fired from a pressurized pipe and killed an employee. opened a valve on the piping behind the plug to vent the nitrogen purge. Incident. The control room operators, not knowing any work was underway, remotely closed the vent valve. The valve could be remotely opened and closed from the control room because the employee did not follow proper lockout/tagout procedures. When the vent valve was closed, nitrogen pressure built up behind the plug. The employee heard the plug shift inside the pipe, so he decided to deflate and reposition the plug. As the plug deflated, the nitrogen pressure that had built up behind the plug launched it out of the pipe at high speed. The plug hit the employee in the head and killed him. Communication. 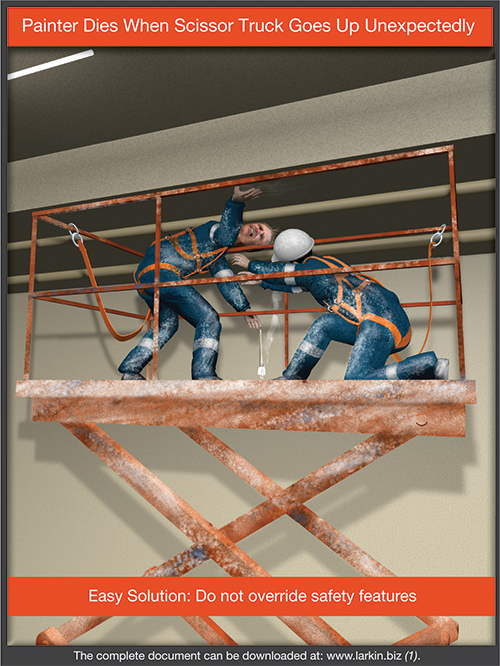 This image is the main page of the safety communication created to warn employees of the dangers of skipping steps in the permitting process and failing to follow proper lockout/tagout procedures. 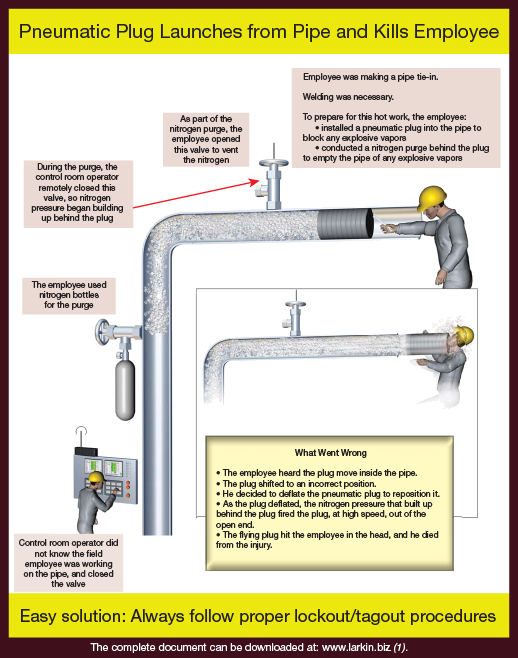 The next page of the briefing describes some of the mistakes that were made that led to this incident, such as not including the control room operators in the pipe tie-in work permit, failing to inflate the pneumatic plug to the correct pressure, and not locking out the vent valve before starting the purge process. It also describes some simple actions that all engineers and operators can take that will prevent them from becoming the next victim. Many engineers are uncomfortable with fear appeals because they are trained to prefer a “just-the-facts” approach to communication. When communicating major incidents, a purely factual or pragmatic approach makes it much more likely the same type of incident will happen again. While a fear appeal may seem unprofessional to engineers, it is standard practice among communication experts. The just-the-facts approach, which is essential to good engineering, is the wrong approach for communicating major incidents. Advertising and public service announcements frequently use fear appeals. For example, AT&T ran a commercial showing a dad dropping off his daughters at school and then, while reading a text message, crashing into a young boy crossing the street (9). In a commercial for a home security company, a hooded burglar kicks in the front door of a house as a mother and daughter try to escape up the stairs (10). An article published in Process Safety Progress (11) stated that the knowledge from past events is not typically retained in the collective memory of the workforce, which makes it likely that similar accidents will happen. A study, conducted in oil refineries, found that most major incidents are remembered for only three years. Unless you were directly involved in the incident, or involved in the corrective actions taken after the incident, the mistakes made and lessons learned from the incident will be largely forgotten after three years. Incident documentation that incorporates a fear appeal can help ingrain the incident and lessons learned in the memory of the workforce, and ensure such an incident does not happen again. Communicating major incidents (e.g., explosions, fires, large spills, multiple injuries, fatalities) is the most appropriate place to begin using fear appeals. Begin building a fear appeal communication as soon as the formal investigation ends. To create a good illustration, you need to first sketch it. Only someone with intimate knowledge of the incident (that is, someone who understands the investigation conclusions) should draw the first-draft illustration. This first-draft illustration may, of course, look childish. After all, most of the incident investigators will be engineers, not artists. After the illustration is finished, it becomes the foundation for the employee communication. The fear-appeal illustration should be the cover. The inside pages should describe the incident in more detail. Within the inside pages, it is best to divide the written details into discrete text boxes. Then, place these text-box explanations around the page with arrows pointing to the relevant parts of illustrations or photos. Avoid using long sentences and large paragraphs. Do not fill an entire page with written text. Breaking up the text into discrete text blocks can increase the number of people who will read it by 82% (12). There are six examples showing how to craft a major incident communication in the brochure “Lessons Learned — Communicating Major Incidents” (1). This can be freely downloaded from www.larkin.biz. An employee died from asphyxiation and a supervisor was seriously injured when they attempted to inspect a pipe flange that was being purged with nitrogen. Background. During a plant turnaround, an oxygen feeder was removed for cleaning. An employee and a supervisor were tasked with cleaning a large, 48-in. flange before reassembling the oxygen feeder. Incident. After cleaning the flange, they decided to do a blacklight inspection, which would help reveal any leftover dirt or grease. In the bright noon sunlight, they could not see the blacklight results, so they decided to cover the end of the pipe with a large sheet of black plastic. The employee and supervisor climbed under the black sheet to continue the blacklight inspection. Unfortunately, the supervisor forgot he had ordered a nitrogen purge. The black sheet created a temporary enclosure and trapped the venting nitrogen. The employee died from nitrogen asphyxiation. The supervisor survived, but was seriously injured. Communication. 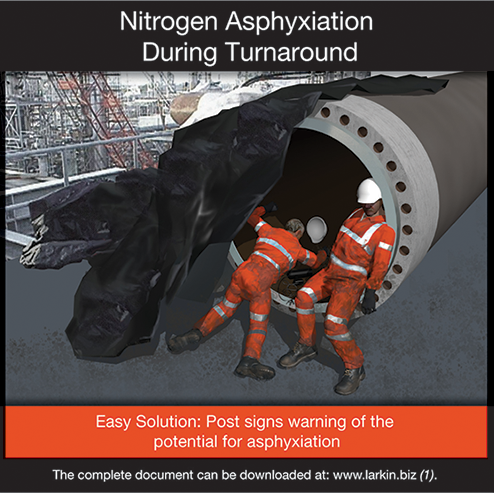 To prevent this type of incident from happening again, an easy solution is to post signs warning of the potential for nitrogen asphyxiation. The documentation for this incident communication is four pages long and includes more details about what happened and best practices to prevent future incidents from occurring. Source: Derived from Chemical Safety Board Investigation Report #1998-05-I-LA. Communication that stimulates emotion will bring about more behavior change than communication that relies on reason. Emotion, not reason, drives behavior change. Therefore, when crafting a fear appeal, you must separate the analytical investigation of the incident from the employee communication. Major incident investigations use a variety of analytic tools such as bow-tie diagrams and root-cause analysis. These analytic tools may form the basis of your investigation, but they should never form the basis of your communication with staff. This does not mean that the investigation’s analytic findings should not be disclosed — the investigation results should certainly be shared with all employees, but analytic details should never be the first thing that readers see. The fear appeal is the centerpiece of your major incident communication, and analytic information should play a supporting role. Even in later communications of lessons learned, a fear appeal should come first. Only moderate levels of fear are necessary. Research shows that images that evoke moderate levels of fear produce the same amount of behavior change as horrifying images (13). The relationship between the amount of fear the illustration elicits and the amount of behavior change begins as a steep positive curve, but then flattens quickly. Keep in mind that when creating an illustration, adding more carnage will not translate to more behavior change. You do not need to create fear appeals that are sensational or shocking. All you need to provoke with your illustration is a small amount of discomfort in the viewer. Since fear appeals work with only moderate levels of fear, you can communicate the incident in a respectful and dignified way and still get the behavior change you need to prevent the incident from happening again. After crafting the major incident communication (which opens with a fear appeal), ask supervisors to deliver the communication in brief, informal, face-to-face conversations. A frontline employee is more likely to listen and internalize the messages delivered directly by his or her superior. These direct interactions are more likely to bring about change in the employee’s behavior. No other form of communication delivers more behavior change than informal face-to-face communication with supervisors (14). In general, if a recommended action is communicated through mass media channels (email, print, or video), only around 2% to 3% of frontline employees will change their behavior. And, only a small fraction of frontline employees will change their behavior based on receiving a formal message from a corporate source. On the other hand, you can expect close to 70% of employees to adopt a new behavior if supervisors ask them to do so in face-to-face conversations (15). For example, a study of eight Dutch chemical plants found a high correlation between the number of informal supervisor-employee conversations concerning safety and a decrease in near-misses and major incidents (16). You should not begin communicating a major incident in an email, brochure, or poster, or on the internet. Mass communication should not be used at the outset. Instead, managers and superintendents should discuss the incident with frontline supervisors, using fear-appeal documentation as a guide for the conversation. Then, ask supervisors to have similar face-to-face conversations with their own teams, again using the documentation as a guide. Supervisors will want to meet face-to-face with their staff members if the fear appeal is compelling enough. After giving the supervisor-led meetings a chance to work, then you can begin to post and distribute the fear appeal documentation. Remember, the maximum amount of behavior change comes from supervisor-led, face-to-face communication. This is your goal: Make the communication difficult to resist; make a fear appeal that is so compelling that supervisors will want to talk about it. And, give supervisors the opportunity to communicate something their team does not already know. After a major incident occurs, the top priority is making sure it never happens again. That is why your communication should use a fear appeal. No other form of communication is more likely to evoke behavior change in employees and prevent them from making the same mistake. Some people will criticize you for sensationalizing the incident, for embarrassing the managers at the site, and for reopening the psychological wounds created by this incident. However, the primary goal of your communication cannot be saving face for managers or soothing surviving employees at the site. Nothing should be more important than protecting your employees from repeating the same mistake. Once you commit yourself to this incident never happening again, you will begin using fear appeals in your communication. Larkin, T. J., and S. M. Larkin, “Lessons Learned — Communicating Major Incidents,” Larkin Communication, www.larkin.biz (accessed June 28, 2018). Albarracin, D., “Fear-Based Appeals Effective at Changing Attitudes, Behaviors After All,” American Psychological Association, Press Release (Oct. 22, 2015). Ruiter, R., et al., “Sixty Years of Fear Appeal Research: Current State of the Evidence,” International Journal of Psychology,49 (2), pp. 63–70 (2014). Witte, K., and M. Allen, “A Meta-Analysis of Fear Appeals: Implications for Effective Public Health Campaigns,” Health Education & Behavior,27 (5), pp. 591–615 (Oct. 2000). Tanner, J., et al., “The Protection Motivation Model: A Normative Model of Fear Appeals,” Journal of Marketing,55 (3), pp. 36–45 (July 1991). Dabbs, J., et al, “Effects of Varying the Recommendations in a Fear-Arousing Communication,” Journal of Personality and Social Psychology,4, pp. 525–531 (1966). Bulzacchelli, M. T., et al., “Circumstances of Fatal Lockout/ Tagout-Related Injuries in Manufacturing,” Journal of Industrial Medicine,51 (10), pp. 728–734 (Oct. 2008). McCurley, L., “Today’s Goal is Tomorrow’s Safety: Harness Based Work at Height,” Research and Practice for Fall Injury Control in the Workplace,” Proceedings of International Conference on Fall Prevention and Protection, pp. 237–241 (Nov. 2011). AT&T, “The Unseen | It Can Wait | AT&T,” Youtube, www.youtube.com/watch?v=hVEBJxS2J_Y (Sept. 1, 2016, accessed June 27, 2018). Brinks Home Security, “Brink’s Home Security - Commercial: ‘Wrong Door’ — Home Alarm & Monitoring Services,” Youtube, www.youtube.com/watch?v=cMpKDZDjBWM (Jan. 20, 2009, accessed June 27, 2018). Throness, B., “Keeping the Memory Alive, Preventing Memory Loss that Contributes to Process Safety Events,” Process Safety Progress,33 (2), pp. 115–123 (June 2014). Swanson, C. E., “Readability and Readership: A Controlled Experiment,” Journalism & Mass Communication Quarterly,25 (4), pp. 339–343 (Dec. 1, 1948). Tannenbaum, M. B., et al., “Appealing to Fear: A Meta-Analysis of Fear Appeal Effectiveness and Theories,” Psychological Bulletin,141 (6), pp. 1178–1204 (2015). Larkin, T. J., and S. M. Larkin, “Silver Bullet: Using Supervisor Communication to Reduce Accidents,” Larkin Communication, www.larkin.biz (2012). Larkin, T. J., and S. M. Larkin, “Communicating Change,” McGraw-Hill, New York, NY (1994). As, S. V., “Communication and Industrial Accidents,” SOM Research Institute, Univ. of Groningen, www.rug.nl/research/portal/files/3111189/01A24.pdf (2001).